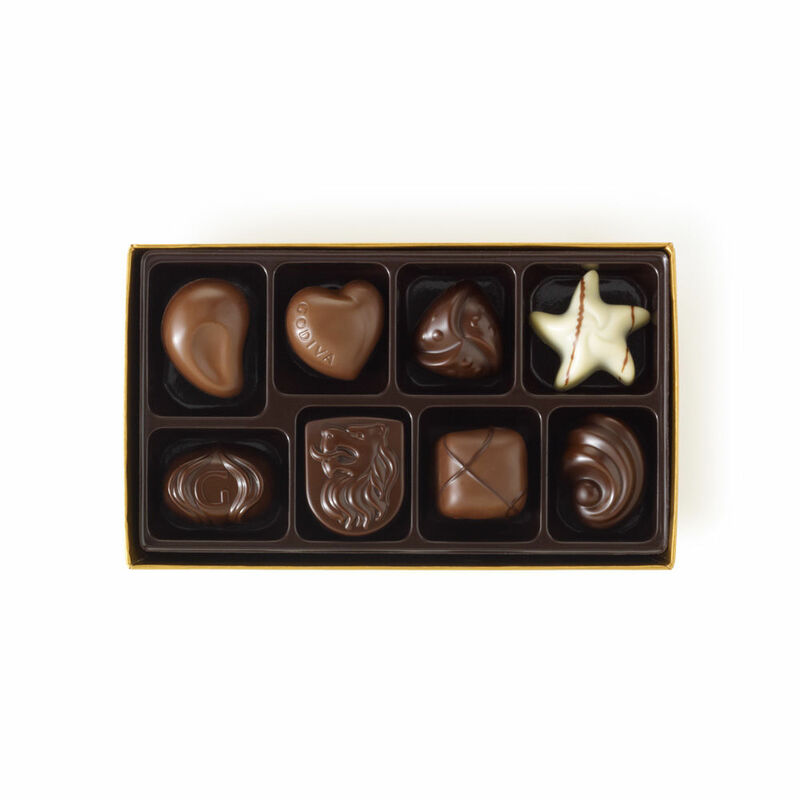 How would you like to win a Box of Godiva Chocolates to give to your special someone, or just to enjoy yourself? I am giving away a fabulous box of Godiva Chocolates! You could win One Assorted 8 piece Chocolate Gold Gift Box! Because I love all of my readers and because Valentine’s Day is right around the corner! I have teamed up with Godiva Chocolate to give one lucky person the chance to win a delicious box of chocolates! Scroll down and leave me a comment telling me what your favorite chocolate is: Milk Chocolate, Dark Chocolate, or White Chocolate. A sweet Valentine’s Day gift for girlfriends or boyfriends and littles ones, too. 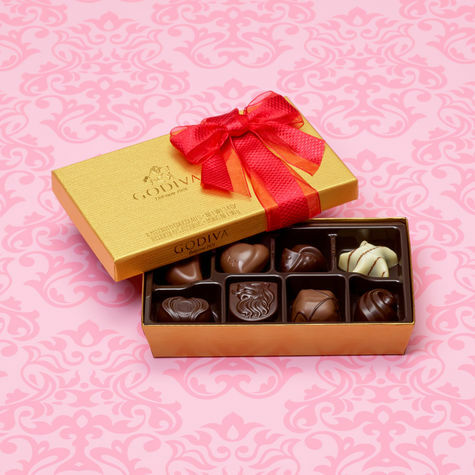 This 8 piece Gold Gift Box is tied with a red ribbon and offers an irresistible assortment of milk, dark, and white chocolates with classic Belgian fillings such as silky ganaches, creamy pralines, rich caramels, plus fruits and nuts. Please leave a comment, What is your favorite kind of chocolate? Milk, White, Dark Chocolate, Any? Also, Please Follow Me on Facebook. Please Subscribe to my Blog. One Winner will be notified via email. One Winner will have 48 hours to respond before a new winner is chosen. Must be 18 years or older to enter this giveaway. Contest is Over: Winner is Steph R.
I’m a dark chocolate fan! Milk chocolate is my favorite. I follow you on FB. I’m partial to dark with fruit. I love white and dark chocolate. . I’m complex.. lol..
Love dark chocolate, with nuts especially. My favoriate Chocolate is Dark. Following on FB, and via e-mail. I love dark chocolate. Happy Valentine’s Day! I love all kinds of chocolate, probably dark first then white if it is good english or european and also love milk. Tough decisions to pick one. Lol!! Your asking me to choose a favorite? lol Um, I love ALL Chocolate….but Grumpy’s favorite is white chocolate. I lean towards picking dark out first. Any chocolate!!! But I’ll go with milk if I HAVE to choose. I love them all, but I guess if I just HAD to make a choice it would be dark chocolate! Definitely a milk chocolate girl! I love all things chocolate 😊. Milk chocolate and dark chocolate are my favorites! Thanks for the chance to win! I love dark chocolate nuts and chews. My absolute favorite is dark chocolate. White chocolate is my favorite, although I wouldn’t turn down any kind of chocolate! Milk chocolate is my favorite but I also enjoy dark. I absolutely love Godiva chocolate! I like all kinds, but milk chocolate is my very favorite! Thanks! My favorite in milk chocolate. It’s always been Dark Chocolate for me. I love milk the best, but I’d never pass up ANY piece of chocolate! Dark chocolate, but I’m sure not picky!